All photos and documents on this page courtesy Tasmanian State Library and remain copyrighted to them. The story of the Tasmanians starts for me with an email from Richard in March this year, 2007. 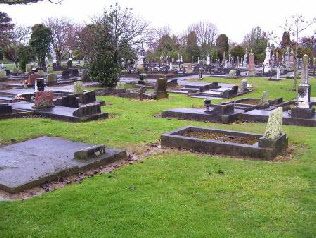 He had found some Tearle headstones in a graveyard, on the Tasmanian State Library website. But one of the pictures states also the grave of Lucy Ethel – though my poor eyes cannot see that! When I tried the site, and entered Tearle into the Search, I found the headstones, too. They were in the Lefroy General Cemetery, just outside Launceston. 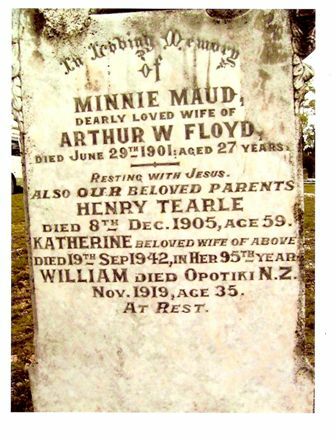 Rosemary deepened the mystery when she found a William Tearle who died in 1919 in Opotiki, NZ. …and Ernest Tearle. But who were they, and what was their story? I sent Aus $20 to Marie Gatenby, the researcher at the State Library, and she sent me some surprising information, and some pictures and documents she said I could reproduce here. 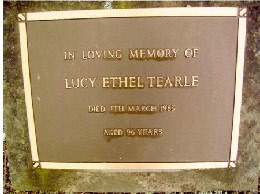 Firstly, there was a picture of the small bronze plaque attached to the base of the headstone above, in memory of Lucy Ethel. Then we took out the photo of the main headstone and we read what was written there. 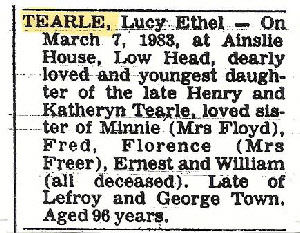 The death notice in the local paper said Charles Ernest, son of Henry and Catherine, was the brother of Lucy Tearle of Lefroy. A Digger notice in the Tasmanian Federation Index said Florence Annie married Josiah Freer in the Methodist Chapel in Launceston in 1911. We turned our attention to the story of William George 1884. William George Tearle, a bushman, died 9 November 1919 at Opotiki, leaving behind a savings account in the NZ Post Office of 221 pounds, 7 shillings and 10 pence; and a horse and motor car to the value of 53 pounds. Cause of death: Intestinal obstruction and post operative shock. The marriage information box is empty. 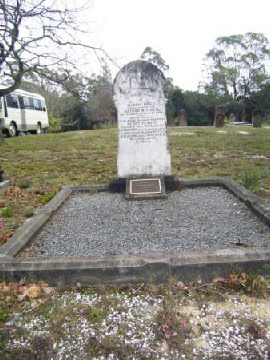 William was buried at Opotiki by a Church of England Minister, Thomas Fisher. There was no question in my mind that Rosemary’s William George and the William on the Lefroy headstone and the William George found in Joan Perkin’s research above were the same man. Then new information came to hand that proved it conclusively. At this stage Richard met Mia Saunders of Whakatane, NZ, who volunteered to go to Opotiki and look up William’s details for us. What she found was a goldmine. She has sent us a copy of the page in the location book of the cemetery and using this she has located the site of William’s unmarked grave. 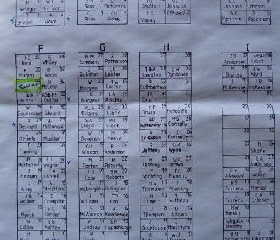 She has also sent us the page of the cemetery register that shows William being buried. All of this was deeply moving for us, and a wonderful gesture from her. Given the date and place of William’s burial, we had identified him at last. Entry for William in the Register of Burials, Opotiki, NZ 9 Nov 1919.
location of William’s unmarked grave, in the triangle of grass nearest the camera, with a general view beyond. I have no further information on Frederick, but it looks as though he has left Tasmania and we may find his story on the mainland. We now know that all of the other Launceston Tearles have died. I met a lady in a cafe in Madrid and she said she was from Tasmania; Launceston, in fact. She knew the Lefroy cemetery and would have a look to see if there were any Tearles in Tasmania. I very much doubt now that she will find any. There may be Freer grandchildren in Tasmania and it would be interesting to know if they are aware of their Tearle connections. Both signed, Witnesses Joseph Tearle and Mary Ann Wright or Loright. This Joseph is probably Charles’ elder brother. And the rest, as they say, is history. A footnote: Apart from the NZ connection with William George, I have another, much closer, connection with the Tasmanian Tearles; I live 15mins walk from St Leonard’s Chruch, Sandridge, where Richard 1754 of Stanbridge and Mary nee Webb married and lived, where Joseph 1788 of St Albans was born and raised, and where this story started. 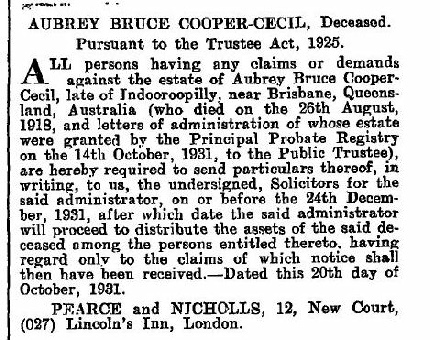 Aubrey Bruce Cooper Cecil served in the 3rd Queensland Contingent, Roll number 205. 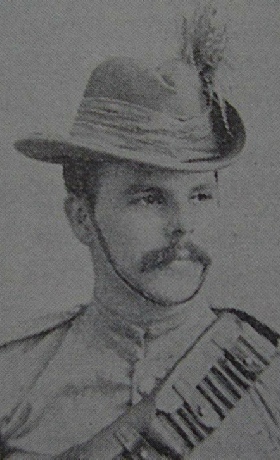 This photo of Aubrey shows him in the uniform of the Third Queensland Mounted Infantry Contingent. His hat is adorned with the traditional Emu feathers. 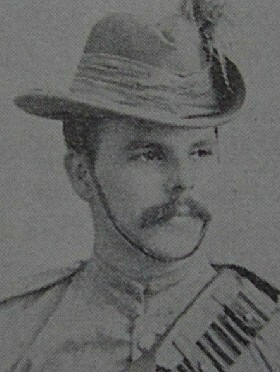 At the conclusion of his tour of duty, Aubrey signed off in South Africa and re-enlisted at Pretoria on 20th April 1901 with the Bushveldt Carbineers for further service in South Africa. The Honourable Aubrey Bruce Cooper, Corporal, No. 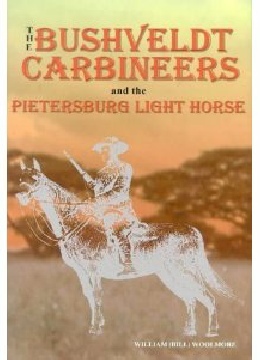 46, of the Bushveldt Carbineers and the Pietersburg Light Horse, Australian, is featured in the book below containing the Campaign trail and the country traversed by the BVC / PLH. 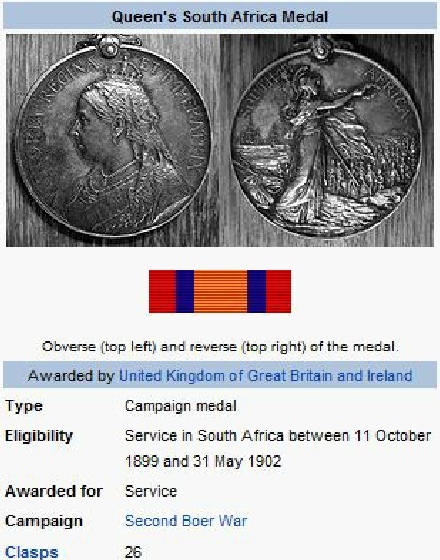 Aubrey was discharged from the Pietersburg Light Horse at Pretoria on 13th February 1902, and his Kings South Africa Medal with the two date clasps (above left) was issued from the Pietersburg Light Horse roll. During 1911, while Aubrey Bruce was in England, he departed from Liverpool onboard the ‘Medic’ and arrived in Sydney, Australia, 10th November 1911. 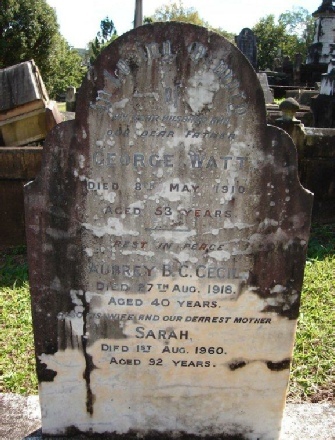 The following year 5th June 1912 he married Sarah Watt (nee Lisk) in Toowong Presbyterian Church, Brisbane, Australia. Sarah was 10 years older than her husband. She was also a widow with seven children aged between 6 and 25 years old. 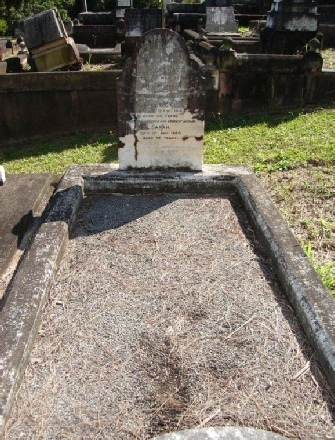 Aubrey was a Clerk in 1913 while living with his wife at 17 (or 178) Ann St, Brisbane. The census shows Sarah at home looking after the children. 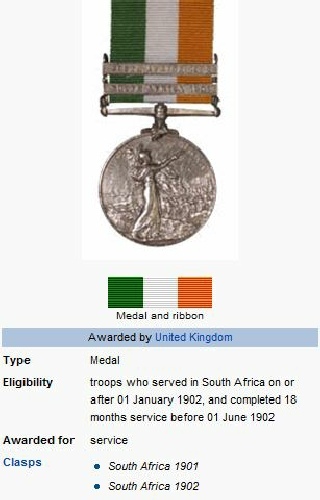 It was only five years later on the 26th August 1918 that Aubrey Bruce died. He was only 40 years old. They had been living at Station Road, Indooroopilly near Brisbane. 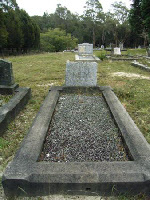 He is buried at Toowong Cemetery in Brisbane, Site Portion 2A Section 32 Grave 2. (Along with Sarah’s first husband, and later, Sarah). Aubrey Bruce and Sarah had no children together and Sarah later remarried. On www.ancestry.com there is probate order dated 14th October 1931, reproduced here. Aubrey’s probate order, in London, 1931.